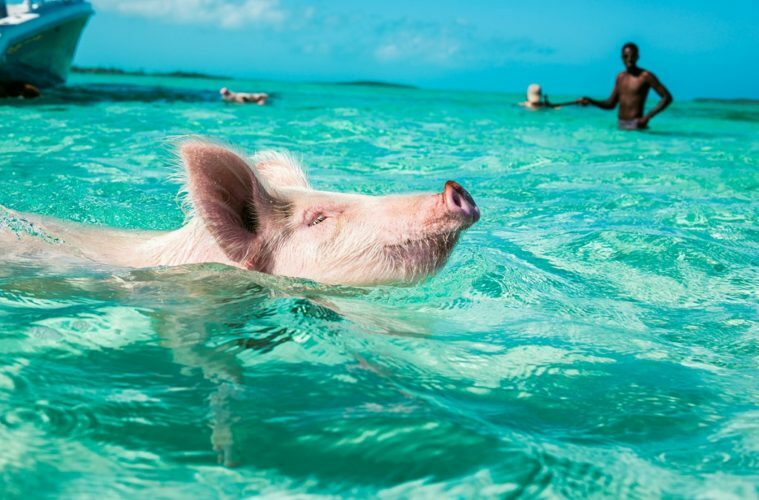 So, you may have heard of flying-pigs, but how about swimming ones? I just couldn’t resist to tell the story of these cute animals that hang out like beach-bums in the Exumas, apparently feral but extremely friendly. Even with superstars like Johnny Depp and Leo DiCaprio owning property nearby, the attention of paparazzi turn to these animals whenever they’re spotted on the beach or in the sea. They’re so famous in fact that they have inspired a children’s book, “The Secret of Pig Island” and a song too, soon to enter folklore. Its unknown how the pigs originally came to live here, but there’s a story that they were dropped off by a group of sailors who intended to come back and cook them on their return leg. Another tale tells of a shipwreck and of these survivor-pigs swimming to safety. And over time, they’ve become adept to spending time in the salt-water, especially with locals and sailors alike offering treats to witness their swimming prowess. As you can imagine, it is quite a sight as you’re passing the beach and a group of pigs peek out from behind the bushes and run towards the sea to you as you pass by boat. The nearby luxury digs at the Grand Isle Resort & Spa is the perfect place to base yourself for this experience of a lifetime, more than just the pigs themselves, this property of 78 magnificent villas is set in an archipelago of 365 mostly uninhabited islands, one for every day of the week. From here you’ll experience an unspoilt, 190km chain of sparkling cays and powdery beaches. And when you’ve had enough exploring, you can melt away in the property’s sublime infinity pool with a view. And to top it all off, this property is a member of one of our favourite portfolios of stunning hotels, Preferred Hotels and Resorts. No brainer!